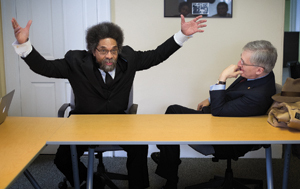 Above and below: Cornel West and Robert George ’77 explore Plato and Mill with students before their Collection. Photos by Laurence Kesterson. 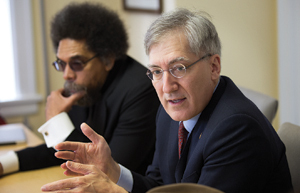 Robert George ’77 and Cornel West admit that they’re an unusual duo. George is the McCormick Professor of Jurisprudence at Princeton University and a leading Christian conservative scholar, and West is professor of philosophy and Christian practice at Union Theological Seminary, the Class of 1943 University Professor Emeritus in the Center for African American Studies at Princeton, and honorary chair of the Democratic Socialists of America. 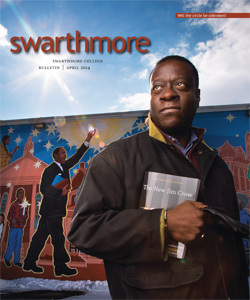 Despite disagreeing on a whole host of political issues, the two professors have connected over philosophy, friendship, and faith. “We’re depicted as being an odd couple, but we’re united to each other in love and fraternal affection,” said George. 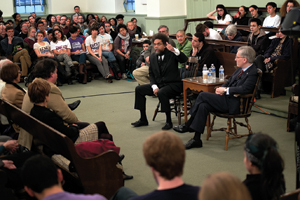 On Feb. 10, George and West led a Collection in the Quaker Meeting House to reflect on the purpose of a liberal arts education. They were hosted by the Institute for the Liberal Arts to share insights from their co-taught Princeton seminars and present a model for discussing difficult moral and political questions across differences. Earlier in the day, George and West offered workshops to engage smaller groups of students and offer a taste of their co-teaching in action. The first workshop was tasked with reading Plato’s Apology, while the second was assigned a passage from John Stuart Mill’s On Liberty, two canonical texts in the history of academic freedom and individual expression. West and George leading a Collection in a packed Meeting House. Both men pointed to Plato as a pillar of wisdom. “That old Greek,” said George, “grabbed me by the lapels and shook me.” Throughout the Collection, the duo also quoted Jane Austen, W.E.B. Dubois, Aristotle, and Montaigne as intellectual guides. This rich tradition, combined with West’s willingness to work with an array of thinkers, enables him to be a “polyphonic” and “jazz-like figure,” explained West. The music metaphor is apt. West uses hip-hop and spoken word performance to bring his advocacy to lay audiences, and George still plays bluegrass banjo, as he did back in the ’70s, when he strummed with his Swarthmore band Robby George and Friends. To watch the Collection talk, click here.